"While there is no shortage of opinions—some well informed, others not so much—about the role and value of educational testing in contemporary society, it is clear that the nature and quality of assessment have had a strong influence on teaching and learning. 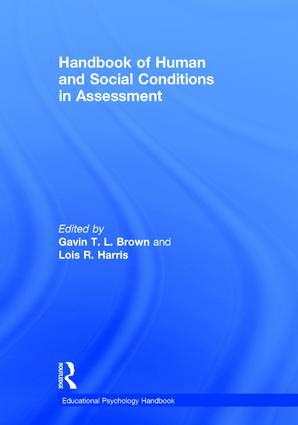 Handbook of Human and Social Conditions in Assessment brings together for the first time scholars and measurement experts from around the world to explore the subtle interplay of assessment methods, their social contexts, and the people affected by these tests and measurements. This is an important book because it offers a synthesis of current knowledge about testing and assessment, and it identifies the salient issues that require further understanding—particularly with respect to standardized testing’s influence on policy and practice. It is a must-read for educators and policymakers alike." Gavin T. L. Brown is Professor and Director of the Quantitative Data Analysis and Research Unit in the Faculty of Education and Social Work at the University of Auckland, New Zealand. Lois R. Harris is a Senior Post-doctoral Research Fellow within the School of Education and the Arts at Central Queensland University, Australia. Edited by Patricia A. Alexander, the Routledge Educational Psychology Handbook Series spans the entire field of educational psychology, providing in-depth, up-to-date coverage of the latest theories, research, methodologies, applications, issues, and policies in each area of study. Each handbook profiles the boundaries and maps the various sectors within its field of study.